What do you think of this cute Set called *Slow and Steady*??? Isn't it super cute??? I did a little masking with this Set.....this is one technique I haven't done in a while, but I think it turned out okay?!? Did you see my cute little sponged clouds - he,he,he??? I started out stamping the snail twice with the Memento Rich Cocoa Ink. The second snail was cut out and layered on top of the original stamped image. Next I inked and colored the grass in Wild Wasabi. Then I punched out a Scalloped Circle with the SU Punch cutting it in half. Before I started sponging my clouds I added the little *dragonfly*. With a fine pencil I drew the line I wanted to pierce the little loop -I gently erased the line after. Next I started sponging around the scalloped edged repositioning it to my liking. The snail and the dragonfly were colored with Copic Markers - E00, N1, R08 and E47. 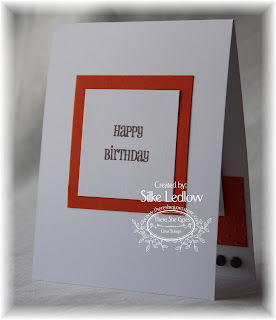 I used Kraft, Tangerine Tango and Whisper White CS for my card. The Tangerine Tango was embossed with the Swiss Dots CB folder. The sentiment was also inked in Memento Ink and punched out with 1 1/4" plus 1 3/8" Circle Punches. The main image and the circled sentiment were raised with Stampin' Dimensionals. At the end I added some Copper Brads. For the inside I used a 4th Set Jessica is releasing. It's called *Holidays Galore* - it is an all *Sentiment Set*. When I created this card my oldest daughter Sarah thought this Set was awesome....what she didn't know was...... it's *her* Birthday card!!! My baby is turning 11 years on Saturday - I can't hardly believe it!!! Anyway - if you like this *Slow and Steady* Set and would like to win it - stop by each and every DT Member and leave a comment. Jessica Knutsen should be the last one on your list....after commenting on her blog add your name to Mr. Linkey!!! Start right here.... Angela, Becky, Bev, Christi, Denise, Faith, Holly, Jessie, Joanne, Jodi, Julie, Makiko, Stephanie, Wendy and Jessica. If you like to participate in this months TSG challenge bring out your Rhinestones, Glitter, Sparkle Pens, Stickles and everything else that you can use to *BLING OUT* out your card. Use *TSG Stamps* and you will be entered to win a free NEW RELEASE Stamp Set! You have until Saturday 12:00 AM EST to get create a project!!! Please use the keyword *TSG04* on SCS or PCP. Make sure to add your project to Mr. Linky as well - HERE is the direct link!!!! Totally cute Silke!! I love it!! Oh my gosh, Silke, this is fantastic!! So adorable! LOVE your clouds and can you believe I've never done clouds? Sounds easy enough!!! Just when I think I've seen it all with this set, I look at another link to another DT member and BAM!! I'm floored again!! Love the colors and LOVE the clouds! Great layout, too! This is so cute Silke, great job!!! Great job at creating a scene with this card. This stamp set is just adorable. XOXO what you have created! I'm LOVIN' your clouds and that dragonfly trail, girl. CUUUUUUUTE!! Beautiful coloring/shading too! Very cute Silke! I love your clouds and the dragonfly piercing! I love all the details. This is adorable. What a fun set, I love the sentiment, TFS. Very cute! Nice and clean card! Love it! i always love your layouts. another fun card. love the CAS look of it. TFS. So sweet Silke, I love it! Silke, this is just so super cute and fantastic!!!! Love it!!!!! I love your scene! This is so soft and pretty! Silke, this is wonderful! Your design really makes the images stand out!! What a fantastic JOB!! You did a beautiful job with this.. I love how you added the clouds. what a lovely card! You did good with your clouds, I've never been able to do clouds well. TFS! Great card. I will have so much fune with this set. This is gorgeous, Silke! Sorry I haven't commented in a bit ... I've still been reading! Love the way you made your main image. Great scene!! I love how you took a "Fun" stamp but turned it into a very elegant card. Your colouring makes it look like it was a cut out from a kids book. I really love it. GORGEOUS Silke!! LOVE your gorgeous design and coloring! Absolutely awesome. I love the dragonfly, the masking and the colors. 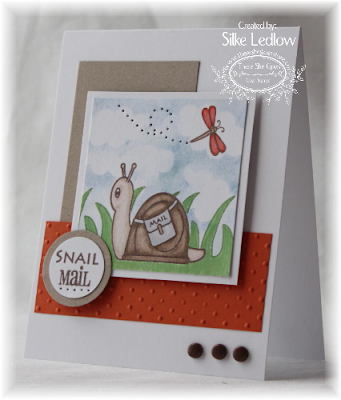 Another great card with that adorable snail! Lovely scene and a very pretty card. Wow! This card is gorgeous! Love the clouds!!! And the snail is so cute!!! I am in love with your color combo! and yourmasking is awesome! Silke, this is just the cutest! Love it Silke! The masking is perfect. Your card is adorable. Thanks for the info on how you made the clouds. Those clouds just make this scene! Love it! Goodness, Silke!!!!! This is stinking cute, WOW!!! Love the clouds and everything else on this card. I'll just have to see and book an all inclusive weekend vacation in GA ;);). I have never even tried all of these things you are talking about here. Love the sponged clouds and the *dragonfly* trail...had to delete my first comment...American idol is distracting me and I typed butterfly instead of dragonfly! This is gorgeous Silke! Love it!! What an adorable stamp and your card is fabulous! What a fresh, vibrant card! Adorable Silke!! Love the dragonfly "trail"!!! Your card is so pretty! Great job! Such a cute card...love the dots! I just love this little snail with his pouch! Love the simplicity of your cards, yet they come out so elegant. Love this card...very cute! Thank you for explaining how you made the clouds. It's a great idea and the clouds are such a great accent to your card. Beautiful as always! How cute is that! I love the little scene you created, nicely done! How cute is this stamp and this card!!!! Love it! This is very sweet!! Love your coloring, piercing and the clouds are a nice addition too! Very cute card! Great coloring and I love the piercing after the dragonfly. This is soooooo cute!! Love the pierced dragonfly tail!! That stamp is awesome and you did a great job with piercing that dragonfly trail. Very cute! I was looking for a link to go buy him - read some more and find out he is a new release so not available yet? Guess I'll go blog hopping!